The first addressed solution works only for HTTPS connections and is based on the HttpWebRequest class, which is also part of the well known WebClient class. If you create an HttpWebRequest, you can get an HttpWebResponse object from it. The certificate is taken from the request instance, but the response must be requested using the GetResponse() function to send the request to the server. Without a request, no certificate is stored in the request object. 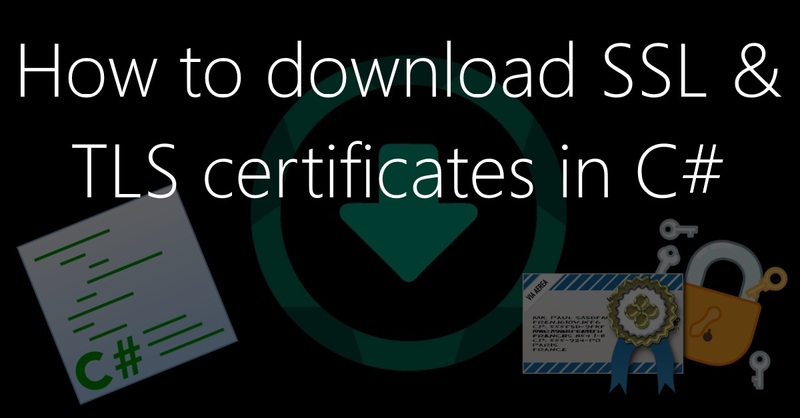 After running the request, the certificate can be taken from the request.ServicePoint.Certificate property. As object type, I have chosen X509Certificate2 because this class is more extensive than the (old) X509Certificate class. As promised, I would like to introduce a second variant. This is somewhat more flexible than the already shown variant, but also somewhat more complicated in the error handling. So we have to create a separate RemoteCertificateValidationCallback here so that we get the certificate in any case. Without this, the code would e.g. throw an exception when the certificate has expired. However, in this case, you may be above all interested in the certificate, which is why we create our own callback and always return “true” for the certificate to be drawn in any case. Then we create an SslStream from the TcpClient stream and access the SSL/TLS certificate via its RemoteCertificate property. 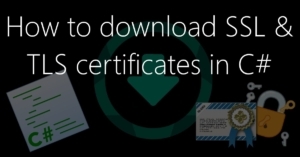 As I said, this variant is not quite as nice as the first, but it offers the possibility to access certificates for almost all types of servers.